Summer is in its last leg and autumn (my favorite season) has slowly begun rolling in. As the final quarter of 2013 is well under way, I can't help but look back and note just how much of an emotional roller coaster the year has been so far. Stepping foot in Seoul many years ago, I jumped into life here headfirst and never really got a chance to ponder about the many facets of my life, its direction and what I wanted to make of it. Tomorrow was always the best day to actually consider such things which was fine initially until all these said things finally caught up with me leading to a necessary hunkering down period of sorts to reflect on said matters. While blogging about cooking, eating and food in general can come off as trivial to many, this humble blog has acted as a sort of catharsis of sorts as I channel and convert some of the built up stress and worked up feelings of these last few months into something productive. At the end of the day, it's the small satisfaction when I see my blog and at how I've combined my bit of knowledge, experience and (very humble) talents into this little ol' thing. I'm reminded then that I can uniquely make something in life if I put in the time and perseverance... even if it's something as minor as a blog. But what I have come to realize is that even the best of dishes cannot transcend to the level of extraordinary without exceptional company. A meal, intrinsically, is simply prepared edible things served for consumption. Pair it with great folks, however, and you no longer have just a shared meal but a shared moment. Hobbies, personalities, interests will differ from one friend to the next but it is good food that acts as the best social lubricant for making the time memorable for even the diverse of friends. Two moment recently perfectly captured this point to me. 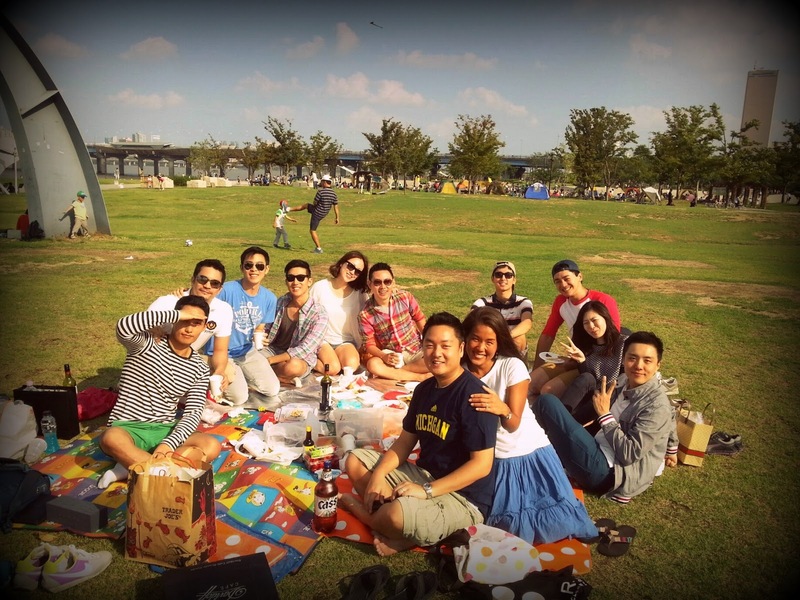 The first was a simple get-together of close friends for a good friend who had recently moved to our neighborhood. Great lengths went into preparing the home cooked meal of lasagna, salad, garlic bread and cupcakes by the friend and it really showed not only visually but taste-wise as well. The lasagna was one of those "oh.my.God" moments where faces became literally flushed with pleasure and immediately lifted spirits. A good home cooked meal not only fills the stomach but it fills hearts knowing the maker has put all this effort and time into giving you a wonderful meal. Despite it being a work night and most of us having work the next day, I'm convinced the food that evening was the initial stimulus that made our group of friends feel so reluctant to end our conversations, our time together, our night which is why things drew to a close for us all past 2 a.m.
And then just this past weekend, a potluck picnic was held with friends on the banks of the Han River. Despite it having rained for most of the week, it was like God Himself had blessed the day as the weather was not only stunning but everything from the temperature to humidity and such, simply perfect. Gathering on a grassy spot near the banks, we spread out our picnic blankets and our respective homemade dishes and the food was as colorful and diverse as the folks gathered there. Pad thai, bento, tako poke, jabchae, musubi, lemon bars were among the smorgasbord of eats laid before us and, paired with some great wine and other drinks, it was simply a magical time of laughter, mild gluttony and sunshine. Aside from all the wonderful tastes from the dishes, you could tell there was so much effort, preparation and love packed inside the various little plastic containers and with each bite and sip, the smiles became wider and the laughter all the more heartier. Time simply flew and no one could believe it when the sun began its descent into the horizon for the day's final few minutes and the evening began to make its claim over the skies. We all have our troubles, our dilemmas and issues as we try and stay afloat through the tumultuous waves of life, but when we are in the company of those we love and respect and we share that time with scrumptious offerings, time stands still as we are reminded that we are not meant to simply exist but to live out our lives. These are the kinds of aha moments in which we go beyond merely restoring our energy but rejuvenating our spirits. And is it not humankind's spirit which has served as the backbone of mankind's progress since the days of Adam? As I continue the journey into the throes of this current year, I'm learning to roll with the punches and look more inwardly for the meanings and directions of life. There are an endless number of things I can fuss and concern about, but I'm realizing with good people and good eats all around, life ain't all that bad. Things, activities, work... all such things which once seemed so fun and enjoyable can become anything but after time passes, however true friends and good eats will always lift your spirits and be enjoyable. And it's those shared times I'm sure I'll look back and remember the most in the autumn days of my life. So if life's been kicking you around a bit and you're feeling unsure of yourself and life in general, go and gather your closest people, get yourselves some good food and let the magic flow on its own. I promise the various feels and thinks you'll receive as you share a meal and share life will be some of the best and unforgettable jolts to get you going back on life's journey. What shall we eat next, friends?